Welsh Labour supporters of a new referendum on the EU have welcomed moves by the party frontbench to support a fresh vote. Labour said on Monday that it was prepared to back another EU referendum to prevent a "damaging Tory Brexit". Pontypridd MP Owen Smith said it was the "right policy", while Anna McMorrin called it a "welcome shift". But Tory assembly group pro-Brexit AM Mark Reckless said there was a Commons majority against such a move. Theresa May is under growing pressure to delay the 29 March Brexit date, amid fears the UK will crash out of the EU without a deal. Labour MP Owen Smith was sacked last year from the party frontbench after he backed a second referendum. He tweeted: "I'm delighted that Jeremy Corbyn now agrees we should put Brexit back to the People. That's the right policy for Labour. It always was." Anna McMorrin, Cardiff North MP, called the move a "hugely encouraging" and said it was a "welcome shift". "The Prime Minister has risked the future of our country kicking the can so far down the road. The only sensible and democratically forward thing to do is to put this back to the people for a final say," she said. A Welsh Labour spokesman said the move was "consistent with the position [Welsh Government] and Welsh Labour have long advocated - Parliament should work to get a deal that puts jobs and the economy first. "If Parliament can't agree such a deal then it should be put back to the people." But Stephen Kinnock, Aberavon Labour MP, said he is "not convinced that a second referendum is the right way to go, given the divisive nature of such a vote, the corrosive impact it would have on the sovereignty and role of Parliament, and because it is still not clear what the question on the ballot paper would be". "But I am nevertheless pleased that Parliament will finally have a chance to express its view on the matter," he said. Mr Reckless speculated on Twitter that the move could help the Conservatives win a general election outright. "Commons majority against second referendum is about 50", he said. 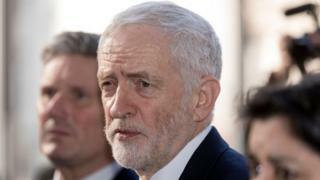 "But nine MPs splitting from Labour and Corbyn losing Leave vote by backing 2nd Ref [equals] we can call an election and win a clear majority for proper Brexit," he added. Plaid Cymru's Brexit spokesperson, Hywel Williams said: "Jeremy Corbyn is being dragged kicking and screaming towards the only sensible solution - a People's Vote. "But still, the Labour frontbench can't bring itself to do so without pointless, time-wasting conditions. It almost seems as if Labour will only back a People's Vote when it is too late."